This entry was posted in Like Show Business and tagged Brandon Anthony, Firefly, Heinlein, Serenity, Star Trek, Star Wars by Mike Glyer. Bookmark the permalink. These are all great battles, although I’ve long thought the Imperial Walkers deployed on Hoth are some of the most impractical heavy armor I’ve ever seen, a feeling proven by how easily several of them were taken down. Edge of Tomorrow did a much better job of Mobile Infantry vs aliens. This might be better titled “Most Cinematic Space Battles” to appease the people who hated the infantry in the movie adaptation of Starship Troopers. How could you possibly overlook the Federation versus the Andromedan fleet from Blake’s 7? I think Monty favourites are the space battles from Trek the TV show. No maneuvering, you just see a little blob in the screen, and the flash of your weapon detonations. It actually gives the feeling of long-range combat. Runner up to the Narn-Shadows fight, where you see the Narn ship firing at something too far away to see. And the Centaurii-Babylon-5 fight where you see the ships firing, and several seconds later the targets get hit. All that actually barely starts to convey the scale of space combat, but they do it a lot better than faux World-War II combat. Does no one remember the Battlestar Galactica running interference for the remnants of humanity, breaking out of a Cylon-surrounded gas giant? My Ghod, I got shivers watching that. The scene destroys many of the choices listed above. Really? You mean that scene that showed as much understanding of military tactics as your average five year old playing cops and robbers? This list doesn’t include the battle from the Babylon 5 episode Severed Dreams, and is consequently defective. Much as I adore the battle in Severed Dreams, B5/BSG/etc. aren’t movies. The thing is, I get that combat on screen really can’t be 100% accurate. More so if you only x number of minutes and y budget to tell the story. Hell, I’m even willing to give some films a pass because (in the case of space battles) we haven’t actually done it yet, so the film maker is in uncharted seas. But ST? I could have used 1/3 the budget and 1/3 the actors and been more believable. It would have marked my second unit directing debut as well, but no plan survives contact. Of course, the movie was never intended to be serious. Absurd battle scenes fit well with the director’s intent, but they are really poor examples to put in this list. The rest are -air- battles, the spacecraft move like airplanes. Star wars is particularly notable in this regard. This is because Hollywood is populated by idiots with the imagination of a finely diced planarian worm. The climactic Human/ Raalgon battle at the end of The Irresponsible Captain Tylor. That’s a bit unfair. The folks on Hollywood for the most part are doing the best they can, constrained by time, money and the need to tell a story that an audience likes. Even Ed Wood *tried* to do that. But to call them idiots is a tad much. The battle at the start of Revenge of the Sith should be on the list. It’s marvelously done, with a really epic revelation of its true scale after an initially tight opening, action that reveals things worth knowing about the two protagonists, and a general awesomeness. That last is a very technical term, of course, but I trust the audience. There’s a space battle in, I think, the Battlestar Galactica remake pilot conducted in pure silence except for an excellent percussive soundtrack. It’s one of the most beautiful, emotional battle scenes I’ve seen in a long time. That’s hardly a reason to settle for second rate movie material. I second Bruce on the Battle of Coruscant from the beginning of Revenge of the Sith. The expansion in scale, from a single star destroyer with two fighters passing by to showing the large battle, is awesome. But personally I have a sweet spot for the Battle of Hoth, just because I’ve done a lot of skiing on Hoth. although I’ve long thought the Imperial Walkers deployed on Hoth are some of the most impractical heavy armor I’ve ever seen, a feeling proven by how easily several of them were taken down. 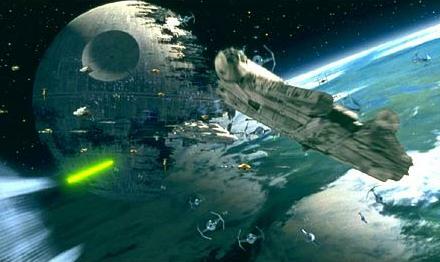 100 % of the Death Stars attacked by Luke Skywalker gets blown to pieces. ~50% of the AT-AT Walkers attacked by Luke Skywalker is taken down. That’s not a horrible record for the AT-ATs. 🙂 And they operate without air support or infantry support, which tend to make all heavy armor vulnerable. And while the walkers have clear weaknesses in combat, I think they work well as a sci-fi movie prop: They’re appropriately futuristic and scary-looking. 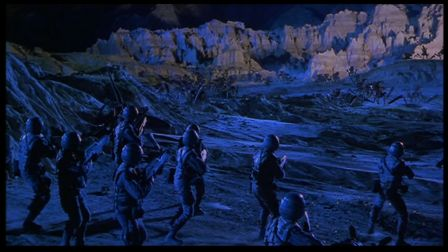 The abomination of the “starship troopers” movie? They had no tactics, no strategy, no intel, poor weapons – by DESIGN OF THE DIRECTOR. THEY DESERVED TO DIE. Enders Game had better space battles, esp the final push. * I happen to know some of the special effects folks who worked on the movie. They BEGGED the “director” to let them do the powered armor – they are SF fans in general and the book in particular. They are *very* skilled at what they do – they would have done a *fantastic* job on the powered armor. But no – the idiot has ZERO clue about SF.